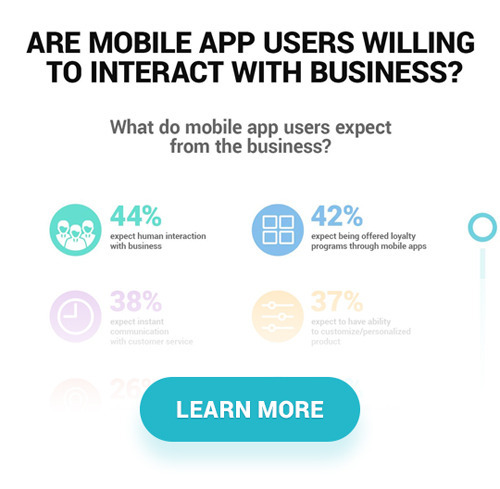 We have collected recent statistics about mobile app users’ expectations just to prove the point that mobile customers are just the same as any customers. They want to be able to speak directly to the business and they want to be heard. Common concerns that mobile app users do not want to be disturbed inside the app go away once you see the numbers such as 80% of mobile app users are ready to share their personal information in order to receive relevant to their app experience messages and avoid spam, 44% expect to have a direct communication channel with business and 42% expect to receive relevant offers and loyalty programs from the business. Efficient communication strategy can definitely enrich positive app experience. All we need to remember that every user is unique as well as the way a user uses a mobile app. Speaking in a personalized manner and customizing messages to match user’s particular needs would never look like spam or pushy advertising. With the help of mobile user engagement tools that provide data about user in-app actions and offer wide opportunities for audience segmentation and targeting, you have the power to engage your users in a smart way that has a value for users as well as enables businesses to boost app revenue. Check out HelpCrunch and see how you can interact, support and engage your app users with the help of one single tool!